Every newbie has a lot of confusion while choosing a web hosting services for their first blog. Many of them are unable to afford costly web hosting and look for a good as well as a cheaper web hosting service. Some web hosts are free and you may think to launch your blog using a free hosting provider. But a free web host has its limitations and not enough capable of providing great performance. At the early stage of your blog, it’s been difficult to drive more traffic to your blog and it takes time to increase organic search. At this particular time period, you can go with some cheap shared hosting and later you can upgrade it to VPS. There are multiple of web hosting providers which offer web hosts at a lower price. Here’s a basic question comes to mind, which web hosts are great for your blog and capable of proving quality web hosting services. Cost isn’t the only factor; you should look for the reliability, quality, performance and renewal rates of the web host you are going to buy. There are many other features that might be required for your custom site, for example, an address of a different country for which services like parcel forwarding might be required. If you need an address of the UK then you should be looking for UK parcel forwarding service. Similarly, to hide locations – try getting a VPN or Proxy. Such services are provided by web hosts which aren’t that expensive. These days it’s possible to get a reliable and quality web host at a comparatively lower price. They come with an affordable price range of $5/ month to even $1/month. This post is all about top 10 shared web hosts below $3 a month. These cheap web hosts will help you in running your website and earn money at an expense comparatively lower than you spend on buying veggies per month. 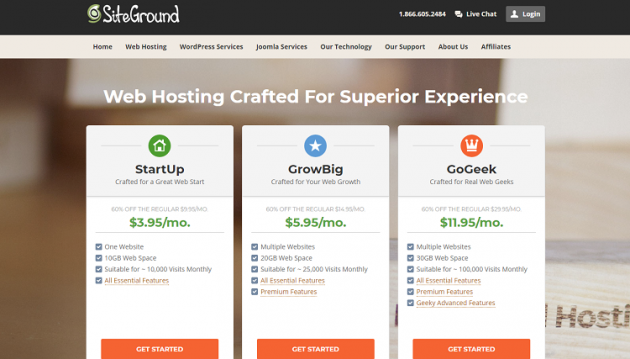 Siteground is one of the best hosting providers when it comes to affordable web hosts. This web hosting service provider was founded in 2004 and currently, it is proudly hosting and powering more than 500,000 websites. Founded by some university friends, this web hosting provider now has become a leading web hosting provider with over 400 employees all over this blue planet. Now, let’s look at its service features and pricing. Siteground is one of the highest rated and popular hosting providers among WordPress users. This web hosting service provider has excellent customer support with 24/7 live chat, phone, and email support. You will get an immediate response to email chat in less than 10 minutes. Pricing is quite fair and plans are great. You can go with its StartUp, GrowBig, and GoGeek hosting plans. You will get enough customer support in launching your blog; Siteground provides valuable articles about hosting, videos, tutorials, guides, and screenshots too. 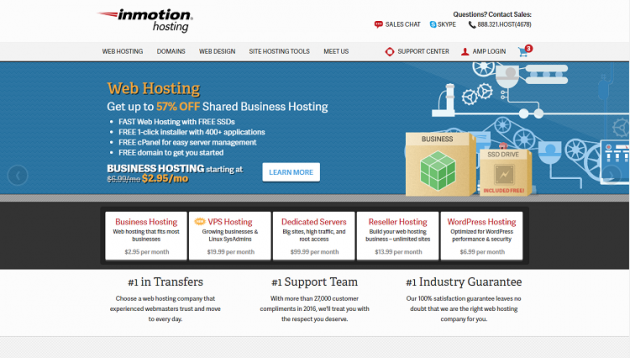 Its hosting plans starts with quite more than $3, but it is worthy of its features. You will get all the basic features required for a reliable hosting including SSD storage, free HTTP/2, and SSL, cPanel and SSH, daily backup, easy WordPress installation, free migration, 24/7 support etc. Bluehost is one of the top leading hosting providers that’s why it is featured at the top of this list. It is founded by Danny Ashworth and Matt Heaton in 2003 and the place was Provo, Utah. Bluehost is recommended by the professionals just because of its excellent features and customers support. You won’t believe but Bluehost powers more than 2M domains and the list is growing every next day. Bluehost comes with a complete web solution and if you are looking for a reliable web hosting to launch your blog in an affordable price, you can go with Bluehost for best hosting features and excellent customer support. Bluehost comes with its basic, plus and prime hosting plans with the pricing of $2.95/month, $5.95/month and $5.95/month respectively. With the basic hosting plan you will get 50GB of website space, unmetered bandwidth, standard performance, 100MB email storage per account, 5 email accounts and many more. InMotion has an excellent team of professionals who are always ready to help you with your queries. It is one of the best web hosting providers which provides fast, affordable and reliable web hosting. Are you feeling down with your site loading time? Don’t worry InMotion provides really fast hosting and its hosting network has extremely fast Unix and Linux operating systems. InMotion web hosting is said to be the only web hosting to provide ‘Max Speed Zones’. With this extraordinary feature, you are free to choose a data center location. Truly this will reduce your site loading time and your website will run approximately 5x faster compared to other single data centered web hosting providers. Max speed zone is available only for business and VPS hosting. InMotion comes with it’s three hosting plans launch, power and pro with the pricing of $5.99/month, $7.99/month and $13.99/month respectively. The plans are quite more than $3, but trust me it provides great hosting features and it’s totally worth its price. All the hosting plans are great and if you are going to launch your blog for the very first time, you can go with its launch plan which includes unmetered disk space, email accounts, email storage, 2 website support, free SSL and data backups, 24/7 customer support and many more. 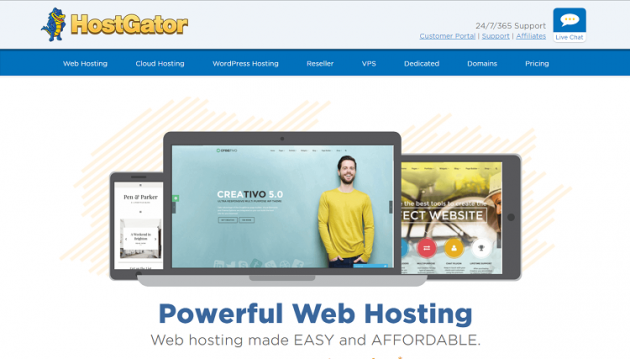 HostGator has done excellent in the world of shared, dedicated, VPS and reseller web hosting since it is founded by Brent Oxley on 22nd October 2002 in Florida. Just after one year of foundation, HostGator had more the 1K active users and currently it powering more than 9M domains around this blue planet. Let’s have a look at its hosting plans. 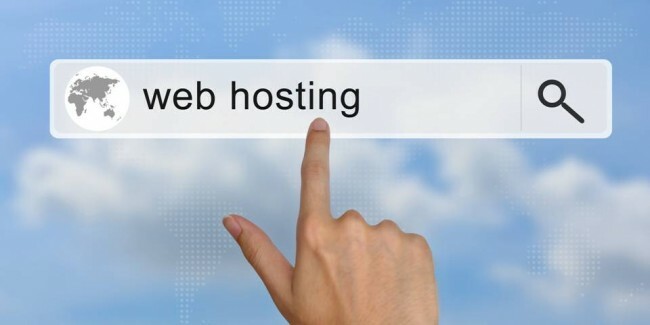 Hostgator provides three hosting plans for shared hosting and they are a hatchling, baby, and business plan. The hatchling plan will be great if you are going to launch your blog and it costs $3.95/month, quite more than $3. Hatchling plan is great if you are looking for a reliable host to power your single domain. With the hatchling plan, you can access single domain at a lower hosting cost of just $3.95/month for 3 years of subscriptions. All of the shared hosting plans come with tons of essential features including unmetered bandwidth, unlimited pages, unlimited storage, unlimited email addresses, latest cPanel, unlimited MySQL with 24/7/365 excellent customer support. 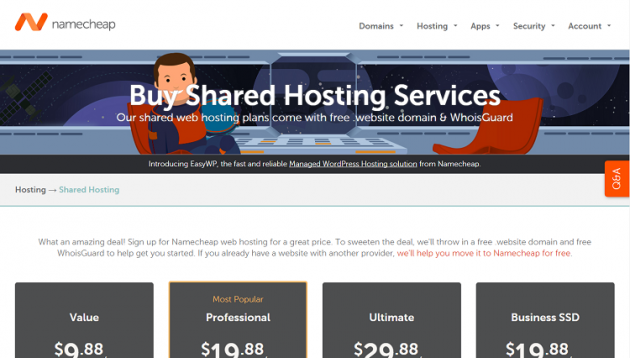 NameCheap is one of the rarest web hosts which come with only 1 year of hosting subscription; it means you have to renew your hosting every next year. The hosting plans are quite cheaper if compared to other web hosting providers. If you are new to blogging and want to launch your personal blog, then you must try NameCheap. If you compare the hosting plans with other web hosts, it comes with the lowest hosting charges at approximately just $10/year or $0.8/month. At the starting age of your blog with little traffic it will great to go with NameCheap and once your blog will grow the excellent customer support of NameCheap will help you in upgrading your hosting plans. You will get your website hosted with NameCheap lower than the annual charge you will pay for registering a single domain name. With the value hosting plan, you will get accessibility up-to 3 websites, 20GB SSD space, unmetered bandwidth etc. If you don’t have a domain name then you can register your domain with NameCheap with a yearly registering cost of $8.78/year for the first year. NameCheap provides excellent hosting features including cheap hosting, 100% uptime, standard hosting security, latest server technology, standard cPanel and of course great 24/7 customer support. GoDaddy is one of the world’s largest hosting providers and domain registrar. It has more than 17 million customers from all over this globe. It is well known for its best domain registering services but the hosting features of GoDaddy are also great enough. GoDaddy has a great team of professionals and more than 6k employees with offices in the world’s top tech corridors. Build your personal or commercial websites going through few simple and easy steps with GoDaddy. GoDaddy provides a complete web solution and it will be great for your blog too. 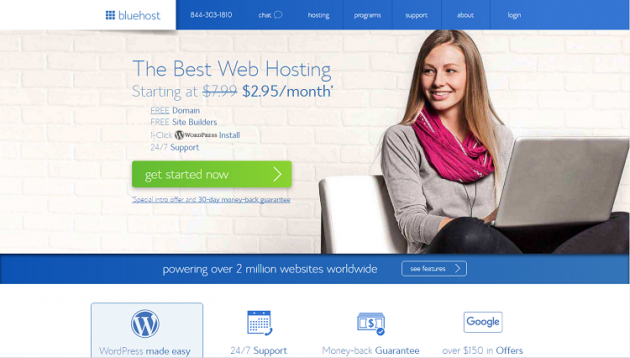 If you are looking for a web hosting provider for your single website under $3, GoDaddy will be a great option. 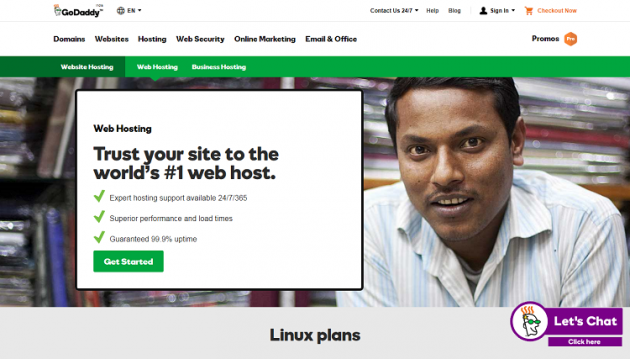 The hosting plans of Godaddy just start with $1.5/month for a single website. You can go with it’s deluxe or ultimate hosting plans if you want to host more than one website. Its economy plan also costs up to $3/month with few add-on features compared to its starter hosting plan. With both of these hosting plans, you will get excellent hosting features for your website including unmetered bandwidth, 30 to 100 GB storage, 50 FTP users, unlimited external domains, WordPress setup, excellent 24/17 customer support and many more. Temok has done extremely well over the years and just after 3 years of foundation it powers more than 8000+ websites around this globe. With the headquarters in Dubai and UAE, Temok has many offices in other parts of this earth including US, UK, and other Asia Pacific countries. 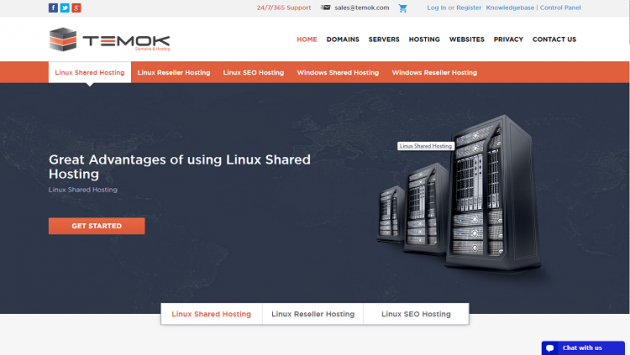 Temok is one of the rarest web hosts which own all of their network and hardware infrastructures and maintain them. This makes them possible to maintain great security and provide great grip over their network system. If you will look at the hosting plans clearly they are great at the cost of $3/month. You will have to pay just $2.99/month for 3 years if you will choose its starter hosting plan. The starter plan will provide free setup, 50GB storage, unlimited bandwidth, subdomains, email accounts, cPanel, unlimited MySQL and many more. If your business or blog grows over time (surely it will be) you can easily migrate to upgraded hosting for more better hosting features. Temok has an award-winning customer support service and provides 24/7/365 support over the phone, email and live chat. 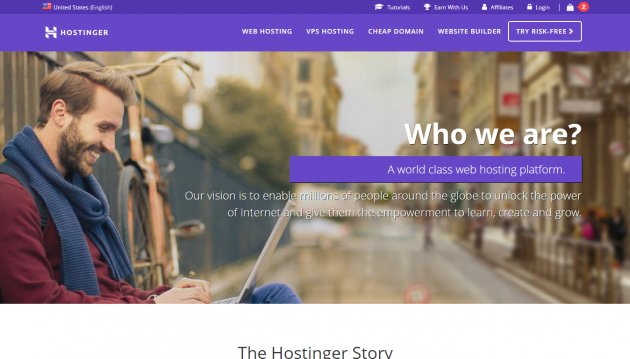 Hostinger is a huge web hosting network powers more than 29M domains and still counting. This web hosting service was founded in 2004 and still doing great in the world of web host networking. Their Linux shared web hosting plans also have three hosting plans for single, premium and business web hosting. You can go with its survival hosting plan which costs just $2.15/month. This is the starter hosting plan of Hostinger which provide multiple hosting features including 1 website accessibility, 10GB storage, 100GB bandwidth, easy website setup, free MySQL database, 1 FTP user, 1 email account etc. 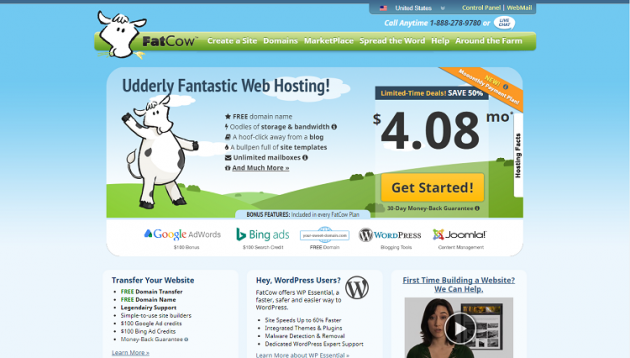 Fatcow is in the business of web hosting since 1998 and doing great since founded. It provides full web solutions for websites including powerful web hosting, domains, and WordPress setup. You can go with its 1, 2 or 3 years of subscription plan with spending just approximately $4/month. Fatcow will be great web hosting option for your blog if you are looking to spend around $3/month for your blog’s hosting. With Fatcow web host you will get unmetered bandwidth, unmetered storage, unlimited emails, free website builder, secure servers, unlimited FTP users and great customer support. It’s very difficult to choose a cheap and reliable web host and thus here I have made this list of top 10 shared web hosts below $3 a month. I have made effort to put all the basic information about a reliable and fast web host at one place. This will surely help you in choosing a great web hosting provider for you single or multiple websites. The entire web hosts listed above is topmost web hosting providers and powers millions of websites all over the world. Before choosing any web host make sure to list the necessary web hosting elements you are looking for, this will help you in finding a great web hosting provider relevant your necessity at an affordable price. This would be a fantastic guide for newbie blogger or site owners. You have picked hosting providers not only who has cheap plans but also they have the best hosting service in the current hosting market. I personally use Namecheap for my sites. Thanks for the great comparison information. Top six are the most renonwed ones out there and almost everyone linked with hosting websites know their names. Host Mayo might not be in the race of big guns but in terms of performance and price they alos compete them very well. Use coupon “blackfriday” for 80% discount on the checkout page for any web hosting plan at https://hostmayo.com.